Are you easily distracted, keep putting things off and find it hard to make decisions and get going? 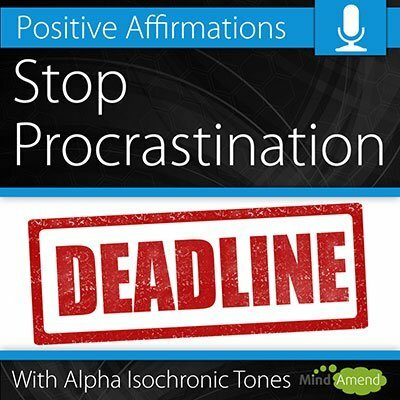 Use the Stop Procrastinating affirmations to help you get more done, stay motivated and take action quickly. Train your brain to get projects done and finished on time. Get started on new projects quickly instead continuously putting things off. Help you to keep moving forward and reach your goals by taking the right action at the right time. Help you stay focused and follow through on the important work you start. Give you the confidence to take action now, instead of worrying that your work isn't perfect and good enough. #Short Term Benefit – If you're finding yourself spinning your wheels, surfing the web and generally getting distracted when you should be working, use this affirmations track to help reset your thinking and get yourself back on track and in the work mood again. #Long Term Benefit – To help combat regular procrastination habits, listen to this track daily over an extended period of time, to help re-train your brain and create new positive habits and work routines. The Stop Procrastination track comes in 7 different versions. The ‘Just Tones' track doesn't have any background music, just the isochronic tones and the affirmations. All the other versions use the exact same isochronic tones session and affirmations, but with an alternative background track for more variety. Note2:: You will not be able to download the mp3 music files ‘directly' to iPhones or iPads because of limitations with those devices. For info on how to get the MP3 file onto iPhones and iPads, please click here.